€15 from Wilde & Green; Rua, Castlebar; Mitchell & Son, chq, Sandycove & Avoca, Kilmacanogue. Seductive rounded juicy ripe dark fruits with a smooth finish. A good all-rounder to partner most roast or grilled red meats. 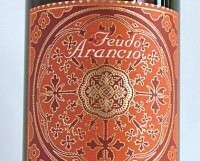 Fuedo Arancio is owned by Mezzacorona, a large company based in Trentino, right up in the north-east of Italy. I have always been very fond of the Fuedo Arancio red wines; the Syrah, at the same price as the wine above is usually very good value. Nero d’Avola is a grape native to Sicily. Ten years ago, it was seen by many as the best the region could offer. The wines tended to be big, oaky and alcoholic. Then along came Nerello Mascalese and Frappato, two varieties that produced more elegant wines, and Nero d’Avola got lost along the way. However, provided the winemaker doesn’t try too hard, they can make very good, balanced fruit-filled wines. As with the wine above.